If you are planning to entertain, be it a sit-down dinner, a cocktail party or just some chill out time with friends and family in the backyard, here is a list of essential entertaining items. These picks are meant for more parties from six to twelve persons. 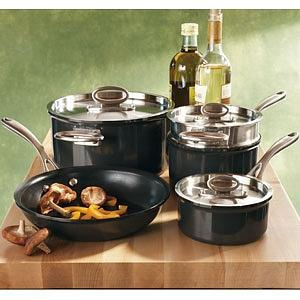 basic set of cookware – two multipurpose pots (rice, pasta, potatoes), 2-quart saucepan (sauces, small stews, beans), 10-inch skillet (eggs), 12-inch skillet (crepes, pancakes) and 6-quart stockpot (soup, pasta, large stews).